Juwan Johnson is getting most of the attention, and rightfully so, among the Penn State receivers this preseason, but another wideout will need to have a big year for the offense to be as explosive as projected. Senior DeAndre Thompkins says he’s ready to take his game to the next level in every way, becoming a more complete receiver who can consistently complement Johnson. What can Thompkins do better this year? If he does, that should mean a much bigger role this season. Thompkins certainly doesn’t lack for confidence, and that’s the one area he said he’s grown the most in his PSU career. “Just being confident, building confidence in yourself knowing that you can play with anybody on the field is the biggest thing I’ve learned and improved on,” said Thompkins, also the team’s starting punt returner. Johnson caught 54 passes last season, second to departed tight end Mike Gesicki, while Thompkins’ 28 catches are the second most of any returning Nittany Lion. Thompkins played in all 13 games, starting eight, and gained 443 yards on those 28 catches with three TDs. 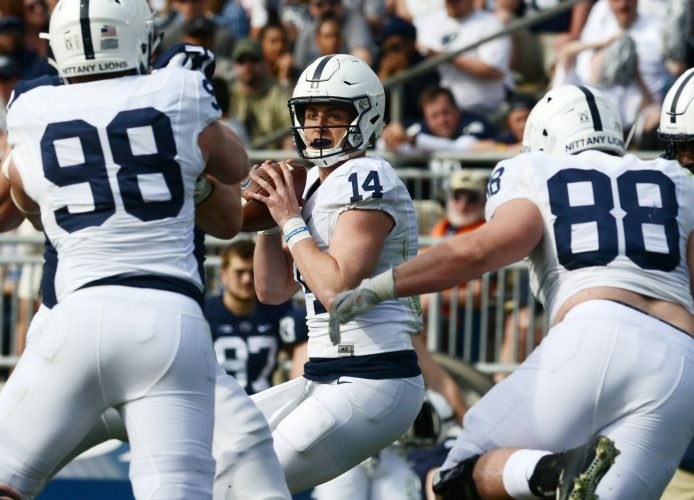 He had a big drop late in the loss at Michigan State, failing to secure a fourth-and-3 pass from Trace McSorley with the game tied at 24. The Spartans gained possession and drove for a winning field goal as time expired. Penn State has had other players overcome key drops and go on to make big impacts in recent years, namely Gesicki and DaeSean Hamilton. Thompkins is a very confident young man and believes he can do the same. 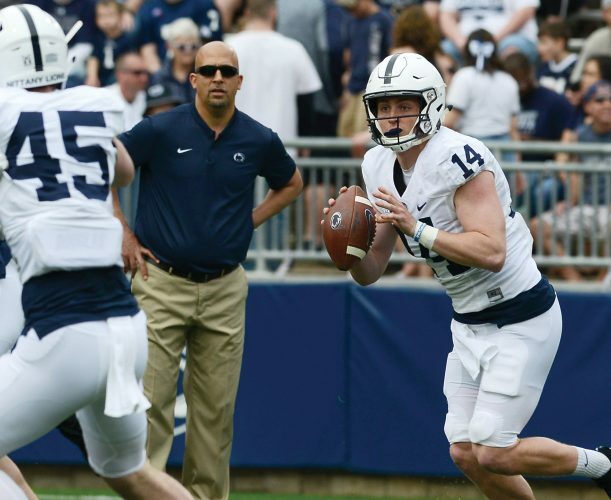 Penn State has a high-octane offense that has put up a ton of points the past two years, plus a Heisman Trophy candidate quarterback in Trace McSorley. Having a veteran quarterback who’s familiar with and works so well with his veteran wideouts such as Johnson and Thompkins is a benefit for the entire passing attack. “It makes everything fun,” Thompkins said. “To have a guy that you’ve been with for a while who’s a veteran guy who’s been through the ropes, little things like even just looking at each other, you can have so much conversation during the middle of a game. Thompkins isn’t just confident in his own abilities, he said everyone on the offense knows the unit is capable of doing explosive things. “Everybody that’s here believes in themselves and believes in the team and knows that we can do great things. You can see it,” he said. “It’s crazy to see the confidence in our team and know that we can make plays and win games.